Get your camera out - this cat is ready for his glamour shot! 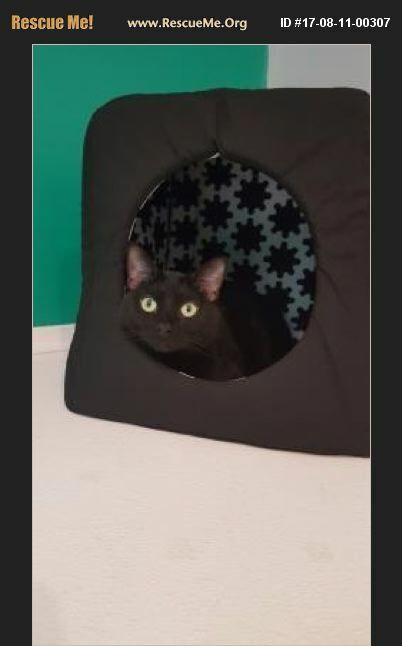 Cam is a luscious 3 year old black cat with the shining fur and emerald eyes of a panther! He came to ACL from a local animal control where he had been surrendered when his owners lost their home. Cam spent some time in a foster home, and his foster mom says he was a blast! Cam loves loves loves to play fetch - he will fetch and retrieve little foil balls all day long if you let him. He carries them in his mouth, too! Cam is almost more dog than cat! He coexisted with a gentle chihuahua in his foster home with no trouble, so he'll do ok with an easygoing dog who isn't in his face too much. He lived with other cats previously, and he also didn't mind. Cam is more of an adventurer and play partner than a snuggler - he'd absolutely adore a home that had lots of time for laser play, catnip mice, and fetch fetch fetch! Cam prefers kids 5 and up.